You all continue to leave me great, encouraging comments — and I love them! Blankie is taking a LOOOONG time to knit. 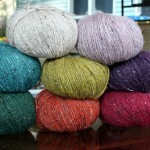 My LYS — Rosie’s Yarn Cellar — posted a few pics from Rowan’s fall line. Very interesting stuff. Lots of cables, and a few new yarns (including 2 self-striping ones). Lisa is also teasing us about a new Koigu product but she didn’t say what it was. Hmmm, now that’s not playing fair, Lisa! Johanna received a comment from blogless winniegirl about this free pattern for a One-Seam Teddy Bear. How adorable and clever! It really caught my eye now that I’m in baby-knitting mode. Someone on the LJ Knitting Community posted a question about historically accurate knitting patterns. Someone linked her to Beeton’s Book of Needlework published in 1870. The instructions are a little difficult to read because the style of instructions and the words are different from what we use now, but I was able to decipher most of the instructions (with a little patience). There are tatting, knitting, crocheting, embroidery and netting patterns. There are stitch patterns, counterpanes, socks, a knitted purse, and lace d’oyley (love that spelling!) patterns just to name a few. And my favorite pattern if for a really cool knitted and braided medallion type piece called “#319 – Rosette for Antimacassar”. I think I’m going to try and knit one just because. Several of you have asked if I designed the blankie. I wish! It’s the Entrelac Throw from Vogue Knitting On The Go’s Baby Blankets 2.
hrmm im not sure how i feel about all those stripey yarns. Looks a lot like noro, but hey maybe better. It’s so sweet of you to let us know where we can find the blanket pattern. I’ll just bookmark that for the time when I need to go crazy with end-weaving-in insanity. Yeah! Go LJ Knitting! After you knit your antimacassar, will you be oiling up your hair to see if it works? Ohmygoodness. The Beeton book is incredible! 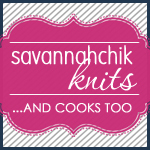 Thanks for the link – I love history and am amazed at the talent of knitters of yore. Thanks for the update. I wish more stores would go to these conferences and shows to bone up on what is coming for fall. It also helps if they write on their blog, newsletter or pdf what they saw, comments, and ask what their customers are looking for. I did go to Rosie’s site, and she is the only one asking customers why they knit and what is being offered in the upcoming season. Smart, very smart. Keep going! Hang in there! Thanks for all the good info…I read the whole thing, but didn’t register anything after the line about a new Koigu product. Hiya — new reader to your blog, love the blankie! If you’re interested in historic knitting, there’s also a Yahoo! group dedicated to that. The website is http://groups.yahoo.com/group/HistoricKnit/ It’s a good group with some really knowledgeable people on it. Oh, thanks for the links to the small previews! 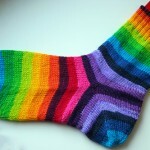 I am interested to see more on those self-striping yarns… looks like Noro. Continued luck with the blanket, Jody! Thanks for the tip on the one seam teddy bear That’s so useful to have around for quick baby knitting, that can also withstand abuse. If I had a dime for every time I came here.. Incredible read.